We're currently studying dates and special days/ holidays. Within the topic is of course, ordinal numbers. My students often have trouble with numbers in general that are past twenty, so I wanted to spend today revising ordinal numbers using some games and spelling activities. Update: I found this video recently and thought if you're still teaching this lesson it could be really useful. It's from FreddiesVille.co.uk , watch here. It goes over the key vocab and has a matching story video as well. Now sadly, Youtube let me down as I couldn't find a song about ordinal numbers so I made my own song and recorded myself singing it for the students. I am not too good with making lyric videos (if anyone is, I'd appreciate the help!) so I made a Powerpoint with the lyrics and played my voice singing separately in the background. You can download my Ordinal Numbers Song Powerpoint and Mp3 file on my teachers pay teachers page. After singing and learning the song we did the reading in the textbook and short writing activity that went with it. Then I told my students they had a mission. I got these really useful worksheets from Twinkl that ask the students to write in full correct spelling, the ordinal number for letters in the alphabet. You can download the worksheet here: Alphabet Ordinal Numbers Worksheet. 1. A is the _____________ letter of the alphabet. 2. O is the _____________ letter of the alphabet. ...and so on. It really kept them interested and practiced spelling. We gave out a handout with all the spelling and numbers in a previous lesson and we allowed them to use it for reference. I also wrote out the alphabet on the board. It was useful to promise the first, second and third students to finish all correctly a small candy or gift. I suggest you do this also to make it a competition. After that activity we played Ordinal Number Bingo which was a great find online - pre-made bingo cards are awesome and convenient ! 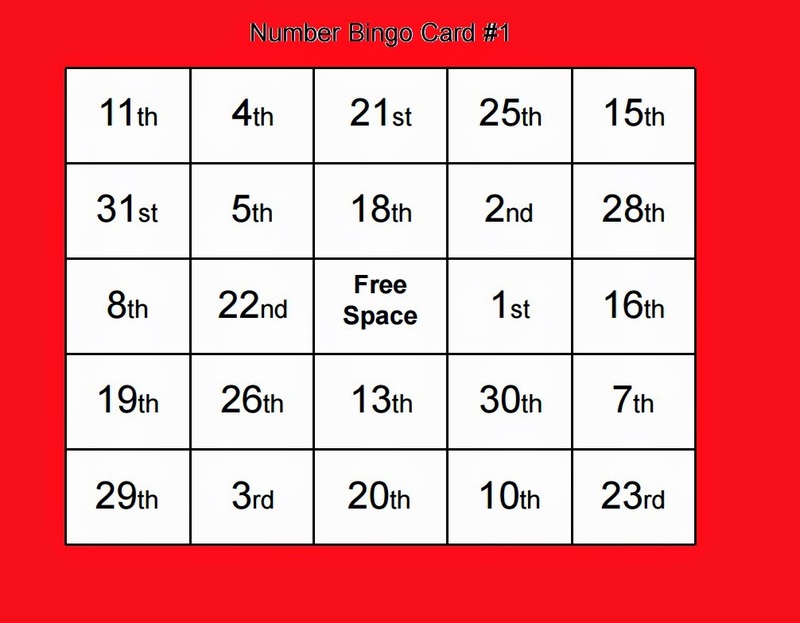 Click here to download, I just printed the cards multiple times to have more for my classes and I changed in Adobe PDF , in the print settings, to have the bingo cards appear 2 per page rather than 1 per page. Sample card (although, I added the read background lol). Now, when you actually play the bingo game you can do it in two ways. You can simply call out the ordinal number "fifth, twenty second..." etc. Or what I did, I wrote it out on the board and the students had to read the word and match it to the numbers on their bingo. Then I heard them all reading and speaking correctly. It worked really well, about 2 students per class won bingo, and I said about 10 numbers so the cards are nice and mixed. Happy Teaching! English After School Class: International Foods! Whose boat is this? Tic Tac Toe Speaking Game!